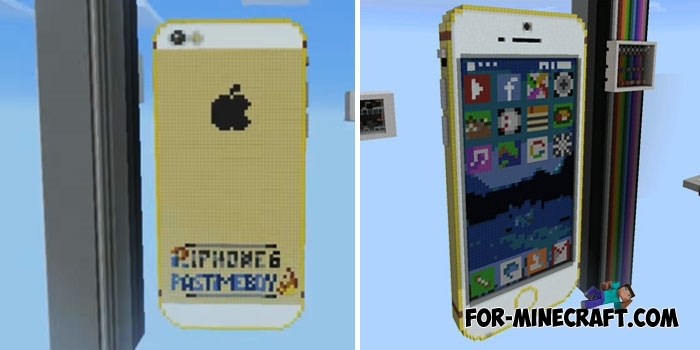 Have you ever seen a working iPhone that has more functions than my Siemens in Minecraft PE? The author of this amazing map spent a lot of time to build and connect all the applications together. This is actually one of the most unusual maps, working with the help of the command blocks. No, it's not just an animation on the phone's screen, here you can switch apps, use buttons and even connect a cable. IPhone 7 Plus mod is a real iPhone allowing you to use the browser, YouTube and facebook. 16 different applications but they only work as a picture. 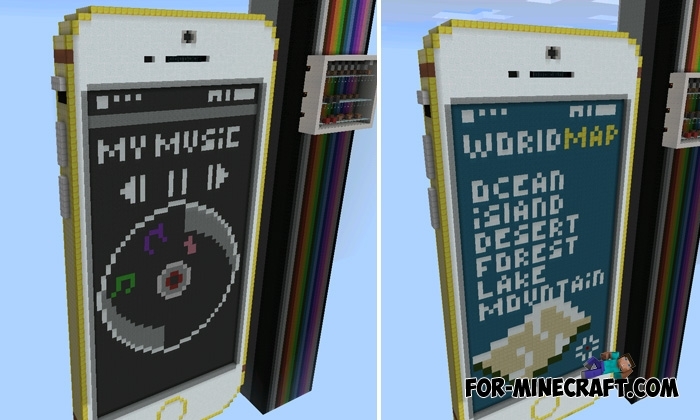 You will find even your favorite Minecraft PE. Possible to change the wallpaper. All the mechanisms are next to the iphone in special boxes. If you want to see what is inside, then gently break the protective layer. 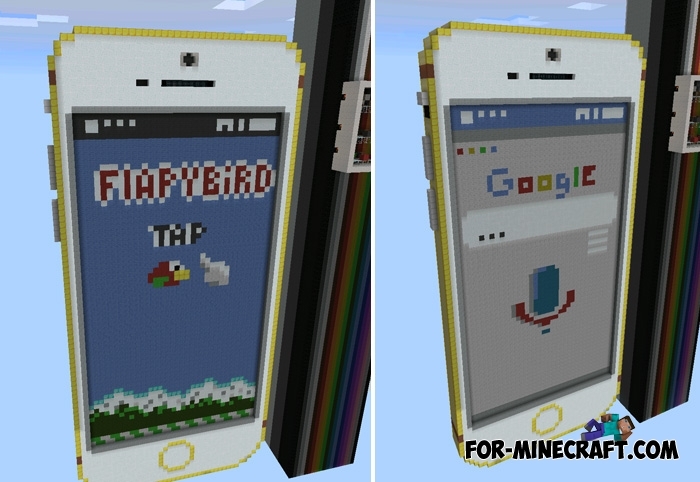 There are many ready-made screens that consist of pixel art. Perhaps this phone will evolve and we will see even more applications and opportunities. 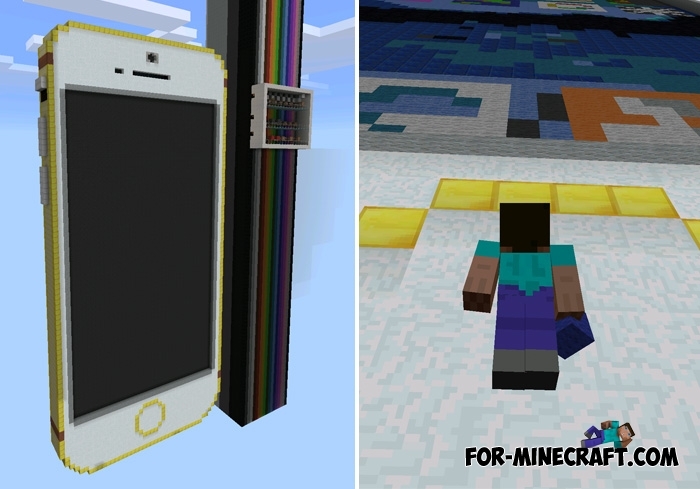 IPhone 7 Plus mod for MCPE 1.0.0/1.0.2As you know, this mod adds almost real iPhone 7 in MCPE 1.0.0/1.0.2. Armor Plus mod v4 for Minecraft PE 0.17.0/1.0.0/1.0.2Armor Plus adds 8 types of armor, each of which has useful features and characteristics. 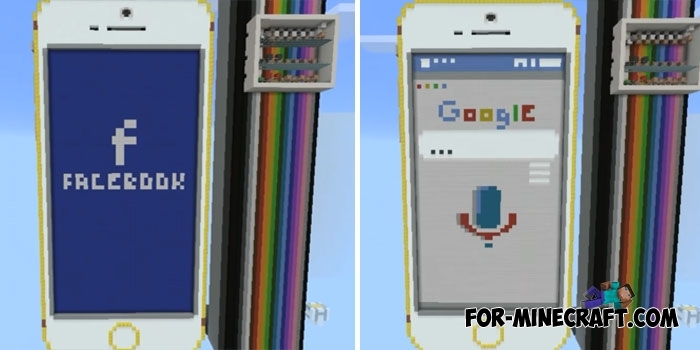 You need only to put new armor set and you immediately get a certain feature..
Pixel art for Minecraft Pocket Edition 0.10.0 - 0.10.5Pixel art map for Minecraft PE - this funny map with pixel art for Minecraft Pocket Edition.